Want to learn an amazing martial art that few even know exists? Want to improve your standing and ground fighting? 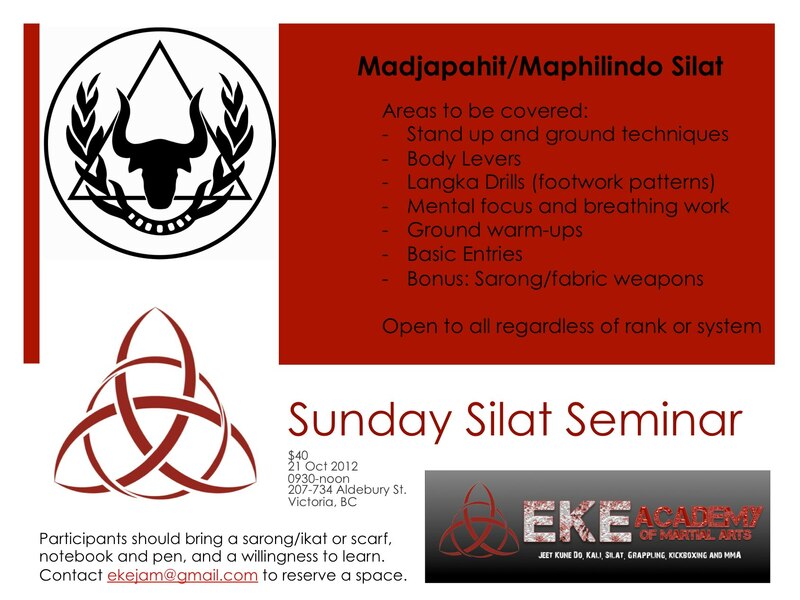 Then come to the Eke Academy of Martial Arts for our Sunday Silat Seminar on 21 October 2012. Learn the skills that will help you survive! This entry was posted in Uncategorized and tagged academy of martial arts, arts, best place to train in victoria bc, book of eli, Bruce Lee, change your life, dan inosanto, EAMA, Eke Academy of Martial Arts, fitness, Inosanto lineage Canada, James Eke, jason bourne, Jeet Kune Do, JKD, jkd canada, JKD Victoria, JKD Victoria B.C., Kali, martial art, martial arts in Victoria B.C., silat, Silat JKD Canada, Uncategorized, Victoria B.C.. Bookmark the permalink.